SendHub for iOS is an app that allows users to receive a free phone line which can be helpful for entrepreneurs and small and medium businesses that want to be able to have a separate phone line, but right on their iPhone. Based on a freemium model, SendHub can be described as a blend of “Google Voice + WhatsApp + business features” according to Zach Segal, Mobile Product Lead at the company. 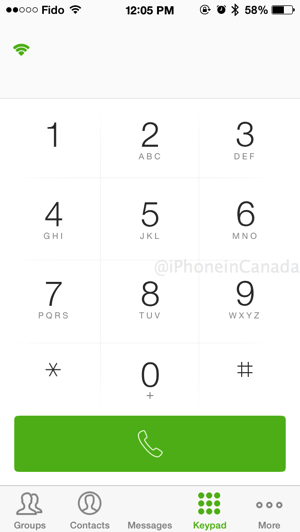 I downloaded SendHub to my iPhone and was able to generate a free phone number (you can pick your area code for Canada/USA) easily and quickly. The app’s recent iOS 7 redesign makes it very easy and simple to use. Armed with my free number, I can now use it to send and receive text messages and calls. 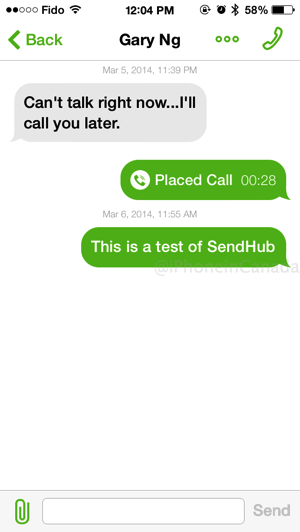 You can even have SendHub text messages forward to your phone number. What’s cool about SendHub is there’s a web interface so you can do everything right in your browser as well, which also includes some advanced features such as scheduling your texts and more. Segal tells us their largest customers (which have up to 300 lines) can assign 1-800 numbers, down to entrepreneurs that just need 1-5 lines with regular numbers. 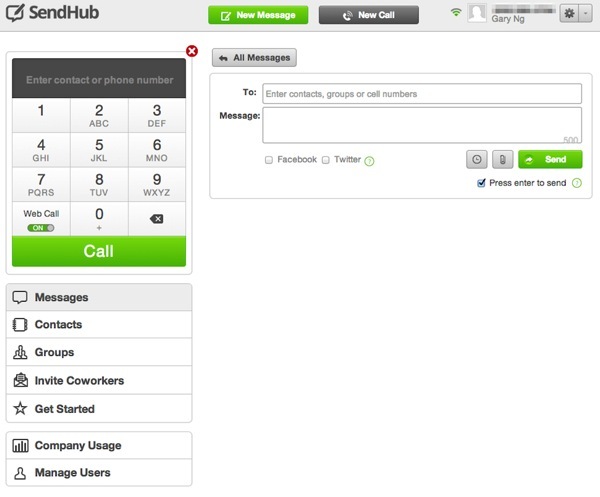 SendHub to SendHub communication via phone or text is always free. SendHub also works with an iPod touch and iPad as well. The ‘Free’ plan gives you 100 text messages, 30 voice minutes, and 3 groups per month (max group size 50) per month, which is decent compared to other services that provide you free numbers. 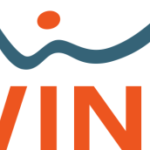 The most popular plan we’re told is the $25/month plan which offers 2,000 texts per month, unlimited voice minutes and larger group sizes and recipient maximums. Other higher end plans include the $49.99 Pro plan and $149.99 Premium plan with more texts and more group size options. 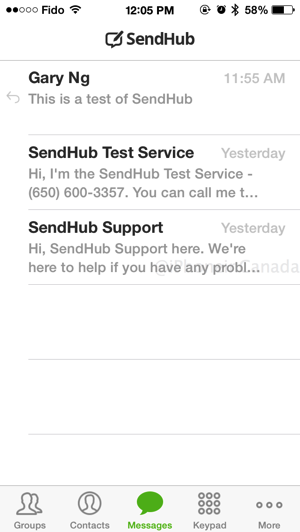 Since 2012, SendHub has accumulated 175,000 downloads in the USA and Canada (with plans to expand internationally later in 2014), with just over 10% of their user base in Canada. I can see the app begin useful for those who deal with Craigslist or Kijiji or some other used classifieds where you don’t want to give out your real number, but respond to messages right on your iPhone. But SendHub’s target market looks to be entrepreneurs and small businesses that want enterprise phone systems but without setup costs and the ability to be mobile. 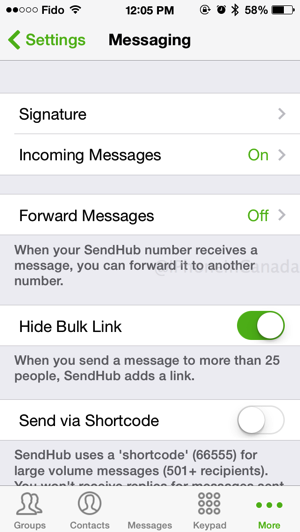 Click here to download SendHub for iOS—it’s free. Let us know what you think of it.